Heat oven to 400°F. Spray 15x10x1-inch pan with cooking spray. In large bowl, stir cornbread mixes, milk, butter and eggs just until moistened (batter will be lumpy). Spread batter in pan. Bake 10 to 12 minutes or until toothpick inserted in center comes out clean. Cool in pan 10 minutes. Cut warm cornbread into 1/2-inch cubes, leaving in pan. Stir cubes. Bake 10 minutes. Stir cubes again; bake 10 to 15 minutes longer or until golden brown on top. Dump cubes into large bowl. Reduce oven temperature to 350°F. Meanwhile, in 12-inch skillet, cook sausage, onion and celery over medium-high heat 7 to 10 minutes, stirring frequently, until sausage is no longer pink; drain if desired. Stir in corn, chiles, poultry seasoning, salt and pepper. Stir sausage mixture into cornbread cubes. 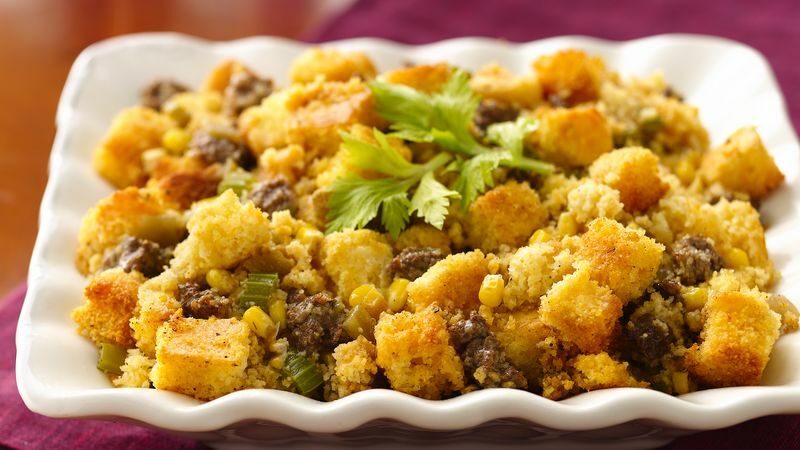 Gradually stir in just enough broth to moisten stuffing without making mixture mushy. Spoon mixture into ungreased 13x9-inch (3-quart) glass baking dish. Cover with foil; bake 25 minutes. Uncover and bake about 15 minutes longer or until hot in center (165°F). You can prepare the cornbread and store in airtight container up to 1 day ahead. Poultry seasoning is a ground blend of sage, thyme, marjoram, savory and sometimes rosemary and other spices. If you can’t find it, use a blend of those herbs.